Queen Kat Designs: Trick Or Treat!!!!!!!!!!!!! Happy Wednesday everyone Janie here today to show you another card I made using an image by Kristie Silva. 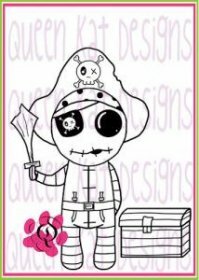 Its from the We Be Pirates line and this little guy is so cute I love him to bits. His name is Stitchling Pirate. 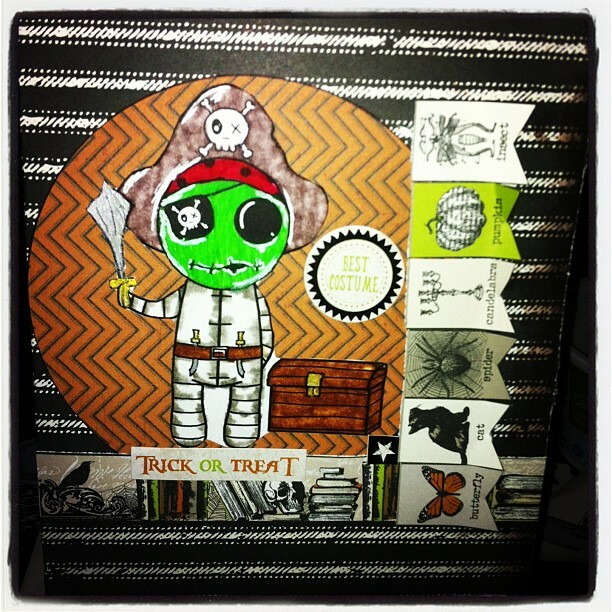 I used my Echo Park Chillingsworth line on this card and I made a Halloween card. I used my copics and I blended the colors to give it a mummy type feel to his clothes. I shaded them with a warm grey color to make them look a little old as well. Great card - love the background & great embellishments! Love this cute little guy! Love those banners too! Great coloring.